Montreal Canadiens defenseman Victor Mete’s nickname of Meat is clearly ironic. He’s anything but a plug in the long term. That much is clear based on his training camp, which led him to get playing time beside No. 1 defenseman Shea Weber. Short term, though? It’s quite possible the Canadiens see him as a placeholder. The Canadiens will burn the first year of Mete’s contract once he plays his 10th game this season. That means, you can probably pencil him in for at least (and at most) nine. He’s earned the nine as a reward for impressing as one of the team’s best defenseman during training camp. Still, Mete may very well become a victim of a numbers game. The Canadiens are currently carrying nine defensemen. One of those is David Schlemko, who is out with a hand injury. While Schlemko may not have the same upside as Mete or project as a capable partner for Weber, he is a legitimate top-six guy and was essentially signed to replace Nathan Beaulieu. He’s done nothing to dispel the notion that he’d be effective in a bottom-pairing, puck-moving role. As such, it’s logical to assume he’s destined to take a roster spot upon his return, leaving the Habs with one more player on their roster than they’re allowed (24). With nine of those spots taken up by defensemen, it stands to reason at least one will have to go. Now, between Mete, Mark Streit and Joe Morrow, it’s clear that Mete is the most talented of the three. Nevertheless, there are unfortunately extenuating circumstances at play here. 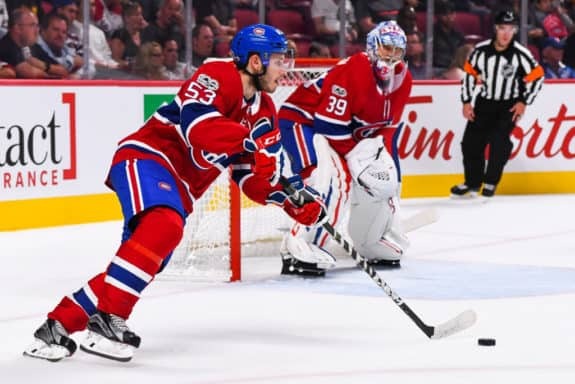 Both Morrow and Streit have one-way deals, meaning the Canadiens will be paying them their NHL salaries even if they’re demoted to the American Hockey League. For many management/ ownership groups, that’s a tough pill to swallow financially. While general manager Marc Bergevin has already proven that he can see past that drawback when he demoted Andreas Martinsen, the Canadiens may find it harder and harder to justify each subsequent AHL player getting paid NHL coin. That’s beside the point that keeping Mete over the other two would be the objectively right decision here. Streit has appeared in over his head on the third pairing in training camp and in the first game against the Buffalo Sabres. And Morrow wasn’t even dressed. Each still brings certain supposed assets that Mete doesn’t. Streit brings over 10 years’ experience. As a Boston Bruin, Morrow was coached by Claude Julien and it wouldn’t make much sense for Bergevin to go out and sign him had he not received some kind of blessing from his head coach ahead of time. Granted, at this juncture, it wouldn’t make much sense to keep Morrow over Mete simply because Julien sees some potential in the former. He clearly does in Mete as well. It’s just that the Habs wouldn’t risk losing Mete by sending him back to junior. By placing him on waivers, they would risk losing Morrow, who, regardless of his struggles to stay in an NHL line-up regularly, is still a 24-year-old former first-round pick. They would also risk losing one of their big-ticket, free-agent signees in Jakub Jerabek. Jerabek, who was assigned to the Laval Rocket, has an escape clause that allowed him to leave for Europe if he can’t make the Habs. It’s just that he has chosen not to use it up to now, presumably as a show of good faith that he’s committed to learning the North American game after plying his trade in Europe up to now. That may yet change, due in part to a relatively obscure AHL rule that only allows up to six players with veteran status to dress in a given game. Since he’s played professionally, just in Europe, up to now, Jerabek qualifies as a veteran. Curiously, the Rocket opted to dress six other veterans, with Eric Gélinas presumably being the one who edged out Jerabek for the last spot in the team’s opening-night line-up (Matt Taormina, as the reigning top AHL defenseman, is going to play come hell or high water). Call it a clerical error, a conscious decision, or a bad omen, but, as of Saturday morning, Jerabek wasn’t even listed on the team’s official roster page. So, if Jerabek is committed to learning the ins and outs of playing in North America, but the organization isn’t to giving him playing time, how much time will he wait before he exercises his right to go elsewhere? Sure, there’s a chance he’s just not good enough, in which case the Habs shouldn’t bend over backwards trying to appease him, but, by the same token, what are the chances he’s not better than Morrow or Streit? Bergevin’s asset management has suffered in recent seasons. 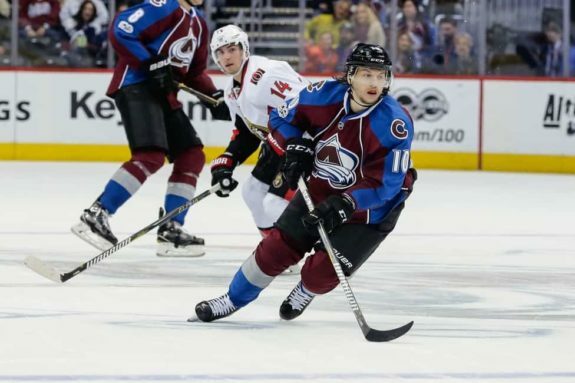 One need only look to the Sven Andrighetto situation, in which the Habs traded away a now-top-line winger who has found significant success with the Colorado Avalanche for Martinsen (or projected career-minor-leaguer Kyle Baun, at this point), as proof. There’s of course a case to be made that Andrighetto never would have gotten a shot with the Habs and any top-nine spot up for grabs would have come down to him and Charles Hudon (with the one losing out headed for the waiver wire). Bergevin nevertheless went out and signed another winger, Ales Hemsky, this summer. So, who would you rather have? A 24-year-old Andrighetto or Hemsky, who’s 10 years older, and is coming off a season during which he played one less game (15) than Andrighetto had points to end the year with the Avalanche? Martinsen, or Baun, aren’t choices for obvious reasons. With that in mind, it would be easy to see the Habs letting Jerabek slip through their fingers as the latest incident characterizing a disturbing trend. It’s also why Mete might be destined to develop further in the Ontario Hockey League this season and, presumably, play for Canada at the World Juniors. There’s nothing wrong with that. There can be with rushing a 19-year-old defenseman too early into NHL action. This is one time when erring on the side of caution might be for the best.